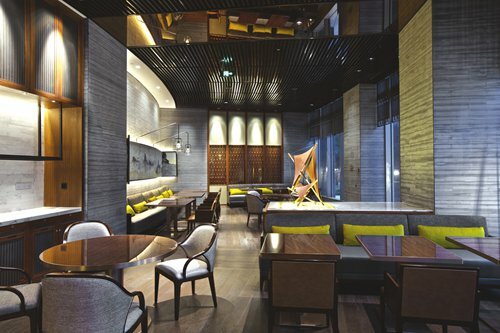 N'Joy's all-day dinner restaurant at NUO Hotel Beijing (NUO) has upgraded its Sunday brunch menu recently and allows the guests to enjoy a gourmet voyage of discovery. The brunch begins with a plate of sea urchin caviar. Canapés, mouthwatering Brazilian churrasco and about 450 kinds of cuisines are served for the guests to choose from. With food, drink and laughter bringing people closer, you can spend your best time with friends and family members at N'Joy. This shows the philosophy of NUO - to give all the guests the finest foodie experiences and lifelong memories. On Sunday morning, with warm sunshine shining through the ceiling-to-floor window on one side of the restaurant, many delicacies from around the world are presented in front of customers. Everything in the restaurant is gentle, beautiful and the food is appealing and interesting because the team of chefs prepares food by heart. Authentic Middle Eastern meat rolls bring you the true taste of the Middle East and refreshing Thai salad brings you to the culinary essence of Southeast Asia. If you are a cheese lover, there are varieties of cheese tables for you to choose from. There are chefs from the Indian curry capital who bring guests the traditional curry recipes with much experience to serve Indian jasmine rice and handmade freshly baked naan. All these delicacies will add to the happy ambiance on weekends for both adults and children alike. NUO's chef team always stays passionate about creating delicious cuisines. N'Joy strives to provide you with a high-end brunch prepared by the team of visionary chefs from different nationalities, who bring you a feast of exquisite international cuisines. N'Joy highly values their ingredients by choosing pure, pollution-free imported ingredients from countries like Italy and Norway, which include fresh oyster from David Hervé, premium imported tuna, sweet and succulent imported lobster on ice and lobster bisque, live-cooked New Zealand mussels en cocotte, pan-seared Rougié Foie Gras, fine worldwide cheeses and superior oscietra, the King of Caviars. This is definitely not only a feast for your appetite but also a feast for your eyes. On N'Joy's Sundays, you can encounter surprises and delicacies. The brunch there is a reward after a long workweek. It can be seen as the perfect dining experience for the whole family and deserves to be called an ideal time of happiness.